Winning the NCAA championship may be the lofty goal of every college sports team, but for the Cardinals’ men’s lacrosse team, that may not be far out of reach. Last season, Wesleyan advanced to the Final Four of the NCAA championship before losing to the second-seeded Rochester Institute of Technology (RIT). The previous year was a historic run for the program, but this year the team has the ingredients to top last season. The Nike/US Lacrosse preseason rankings agree, placing Wesleyan in the first-place spot among all Division III schools. Wesleyan’s preseason dominance comes from many strong returning players, whereas other teams in the top ten will have to replace many players who have graduated. Star returning players include Ghesquiere and attackman Harry Stanton ’18. 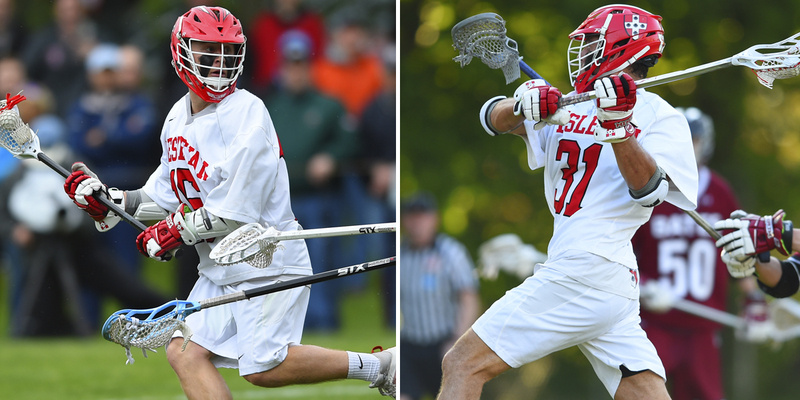 The pair are on United States Intercollegiate Lacrosse Association’s (USILA) player of the year watch list—a list that only includes 12 players from around the country. Despite making the list, Stanton is staying focused on the team’s success rather than his potential to win the award. Reflecting Stanton’s team concentration, Ghesquiere diverted attention away from himself and onto the talent of his teammates. To say that the team earned accolades last season is an understatement. Seven players earned All-American honors, five of whom are returning for the 2018 season. Head Coach John Raba was named the Division III Coach of the Year by the USILA. Former goalie Ted Bergman ’17 was named Goalie of the Year. Stanton outscored the entire NESCAC with 115 points and set a program record with 86 goals. The team broke several records to earn those accolades. Stanton is 90 points short of a program record. He also ties the University record for most goals in a game with eight. The records don’t stop with Stanton either. Carter Hawthorne ’19 and Ghesquiere are two of the highest point-scorers in the program’s history. Hawthorne destroyed the assist record with 55 assists last season. This success comes at a price. There’s an added pressure on the Redbirds this season now that every team knows what they’re capable of. Stanton spoke about the pressure the team feels and how they’re dealing with it. Several players expressed an eagerness for the upcoming season but also a level-headedness for the road ahead. Beyond the next season, the Cardinals have a pool of talent to carry the program to new heights in the future. “We reload our entire offense and almost our entire defense, but we’ve also had a bunch of younger guys stepping up and making every practice really competitive,” Ghesquiere said. Midfielder Cole Turpin ’18 shared the same sentiments about the depth of the roster. “We have 50 guys that, when any of them they step on the field, they are a threat,” Turpin said. After the historic run of last year, the Cards look stronger than ever. The ultimate team’s goal is clear: win a Division III championship. But it’s hard not to speculate what records players will break on the path to a championship. Stanton summed it up perfectly. Connor Aberle can be reached at caberle@wesleyan.edu.